Go stargazing wherever and whenever you like with iStellar! 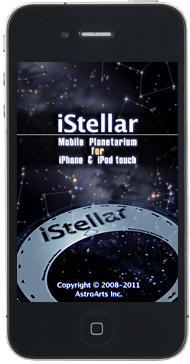 iStellar is planetarium software by which you can simulate the starry sky anytime and anywhere. Its touch interface provides smooth operation for full enjoyment of the beautiful starry sky. Fixed an error where the sunset glow failed to appear. Fixed a potential crash at startup that could occur with iOS 9. Added display of 'Hayabusa 2'. Copyright © Inc., All rights reserved.